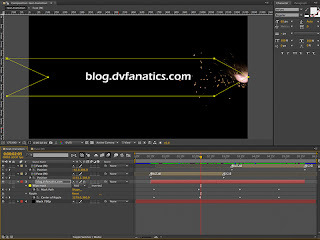 The lit fuse text transition mask bringing in the text layer. Last week in Dissecting the Video: Mission Impossible Text (Pt 1), we prepared the first After Effects comp of the fuse with alpha. This week we'll build the main composition of the fuse burning in and leaving the text in its path. As mentioned last week, this composition will be a 6 second 720p comp. I've started by adding a black Solid layer (this layer is optional). 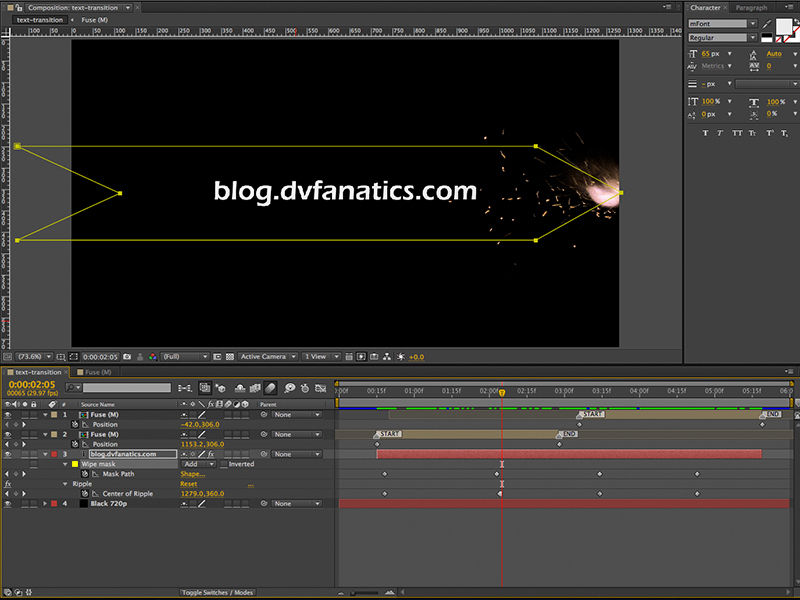 The next layer is a centered text layer, in this example the text is "blog.dvfanatics.com". I've placed the start of the text at 15 frames in from the start of the comp. On top of the text I've placed the Fuse (M) comp and trimmed it to the START and END Markers that were added in last week's blog. The START Marker should line up with the start of the text at 15 frames. A Position keyframe is added at the START of the Fuse (M) comp and it is moved screen left until it is fully off the screen. The Position keyframe at the END marker puts the Fuse (M) just off screen right. This left to right motion is what will reveal the text in the finished effect. The Fuse (M) comp placed in the main comp with its Markers visible. On the text layer, create a Wipe Mask with a Mask Feather of 10. The Mask I created has a point on its right side and an inverted point on its left side (see illustration at top of page). The height of the Mask is about 4 times the height of the text. Find the frame where the fuse just starts to enter the screen, add a keyframe to the Mask Path and move the Mask to the left so that the right pointed edge of the Mask aligns with the center of the fuse. Once you have the first Mask Path keyframe, find the frame where the fuse is at the right edge of the frame, add another keyframe and move the right pointed edge of the Mask so it is over the center of the fuse. 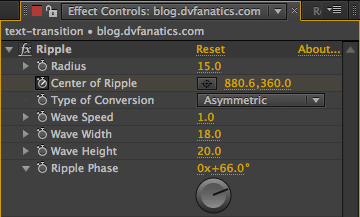 Finally I've added keyframes to the Center of Ripple parameters. The Y parameter should remain in the vertical center of the text and the X parameter should change in the two keyframes. These keyframes should be on the same frame in the comp as the Mask Path keyframes and should be adjusted to align with the center of the fuse at both the first and last keyframe. The text transition in the theme of Mission Impossible is ready to go. If the steps from this tutorial are followed, you should get something that looks like the following video. Below is how I originally used this technique in my demo reel.